British authors, Gill Hines and Alison Baverstock focus on the 18 to 25 year-old group who are just emerging into adulthood. They not only look at what is happening to these young adults around issues such as employment, sexuality, unexpected pregnancies, children living at home, unmotivated couch potatoes, drugs and alcohol, they also deal with parents who may be facing similar issues in their own lives at the same time as their children. The organizations and social services they mention are British and so Canadians and readers of other nationalities will need to do their own research to find similar help where they live. Hines and Baverstock are loud and clear about letting our young adults grow up by allowing them to make mistakes and to not confuse our children’s best interests with our own. Whether it is an unwanted pregnancy or a career choice, we have to step back and let our young adults decide what is best for them to avoid confusion now and life long resentment. We can help present options and the consequences of choices in a neutral way, but the final decision should rest with the young adult. One of the most interesting and useful chapters is on how to help couch potatoes still living at home. These are the unemployed young people, who spend their waking hours in front of the television or surfing the internet with occasional trips to the kitchen for snack food and very little break in the routine. They take little or no pride in their personal appearance and they tend to be aggressive, surly and despondent. The authors deal with how to communicate with them, how to suggest small activities at first to boost their morale, and how to get them back into the labour force, if it is only cutting grass and doing odd jobs at first. Making an effort to fit in with their schedule rather than having them fit in with yours. Just be pleased to see them, whenever they show up. To get comments that make them feel guilty about not thinking about you or seeing you. 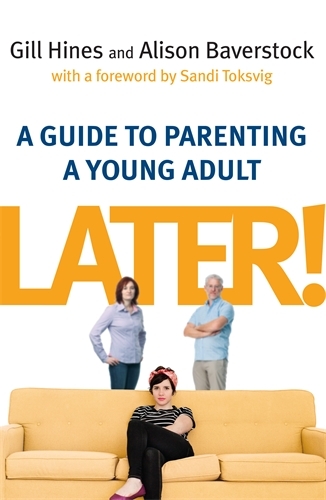 The book is laden with information and tips and would be useful to parents to help them avoid mistakes when their children are coming of age. What do you think young adults in the 18 to 25 year old age group want from their parents? I would love to hear from you so please respond in the Reply Box below. Next Post: Come home to mama now!